Cool Jerk » Archive » Shop Small this Saturday (Nov. 30)! 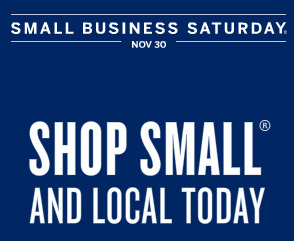 Shop Small this Saturday (Nov. 30)! Tomorrow (Saturday, Nov. 30) is Small Business Saturday. Please do consider patronizing small businesses, including the Cool Jerk store. You need to go to the website and register your American Express card in order to qualify, but the gist is: spend $10 or more at a small business with your AMEX card and you’ll get a one-time $10 reimbursement. Be sure to check their website for all the details. What we’re talking about is $10 in free purchases, basically. • Get some comics and trade paperbacks at Southern California Comics (8280 Clairemont Mesa Blvd. #124, San Diego; 858.715.8669). Tell owner/comicsologist Jamie Newbold that Cool Jerk sent ya! • Get some artworks at Steam Crow (online). Tell owner/art genius Daniel Davis that Cool Jerk sent ya! • Get some stationery or commission some cupcakes from JustJenn Designs (online). Tell owner/design maven Jenn Fujikawa that Cool Jerk sent ya! • Get even more comics and stuff from Alter Ego Comics (331 7th Ave., Marion, IA; 319.373.8935). Tell owner/pug aficionado Erin Tapken that Cool Jerk sent ya! • Get some shoes at Nu Shuz (207 Ave. Del Norte, Redondo Beach, CA; 310.792.7865). Tell owner/shoemeister Teresa Loberg that Cool Jerk sent ya!